Peter was studying geology at Auckland University when a chance trip to Antarctica led him to a life-long interest in its climate history. Initially he studied the Late Paleozoic Gondwana strata in the Transantarctic Mountains. However since 1975 he has led a series of offshore drilling projects for a history of Antarctic climate and ice sheet behaviour since its inception around 34 million years ago. In recent years he has become interested in the perspective that climate change on geological time scales provides for future human-induced climate change. 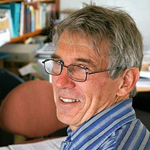 After gaining a PhD from Ohio State University in 1968, he returned to New Zealand to become Founding Director, Antarctic Research Centre, Victoria University of Wellington (1972-2007). From 1998-2004 he was New Zealand’s representative on the Antarctic Treaty System’s Committee on Environmental Protection. He was elected an Honorary Fellow of the Geological Society of London in 2011.